Beading Needles Size 10 Short, Bohin France  - $3.06 : Yarn Tree, Your wholesale source for cross stitch supplies. Item 3503. Bohin France short beading needles size 10 are only 1 1/4" long. Fourteen needles per card. Sold by the card. Please order by number of cards. Very tiny eye so you can bead with small beads. 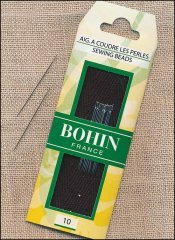 Sharp point beading needles from Bohin France. Exceptionally smooth, high quality needles. Nickel plated steel. Bohin 01124.